This guy gave a license number on his ad. Wonder if he thought that after 31 years, no one would notice a dead guy? Do you guys use sequential lic. numbering? There is only one (1) single digit licensee still around here in NJ. Yes, we do use sequential licensing. The numbers are for all the building trades, irrespective of the trade. AFAIK, The first CA license number was 100000. There may have been an earlier numbering system, though. Recently, we ran out of 6 digit numbers at 999999, and now we now have some 7 digit license numbers. NJ is a little complicated. Each trade has its own sequential numbers. ECs started at 0001 back in the day. Today the 'newbies' are in the 17500+ range. I worked for # 0005 for a few years, then went out on my own, #8209. Electricians are "EI" prefix, Home Improvement guys are "13-VHO", Burg Alarm is "BA" etc. The number remains with the person forever. The business has a business permit using the licensees number. IF the licensee starts another business, the BP gets an "A" after the number. A few guys are midway thru the alphabet. Last trade to require licensure is the HVAC guys. That was within the last 6-9 months. The licenses here depend on the prefix attached to it to differentiate the trades. Licensees that hold multiple classifications have multiple prefixes attached to their one license number. An "A" contractor is a General Engineering contractor. A "B" is a General Building contractor. A "C" contractor is a Specialty Contractor. There are 41 types of SCs, for example: C-10 Electrical, C-20 Heating & AC, C-36 Plumbing and so on. Additionally, there are 61 "D" Limited Specialty contractors, encompassing everything from a D-59 Hydroseed Spraying to a D-29 Wood Tank contractor. 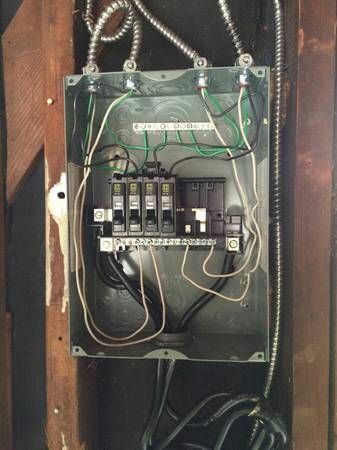 Wonder if he had a friend impersonate an inspector, to make the homeowner think that the work was good, and to make the homeowner think the "electrician" really did have a license?